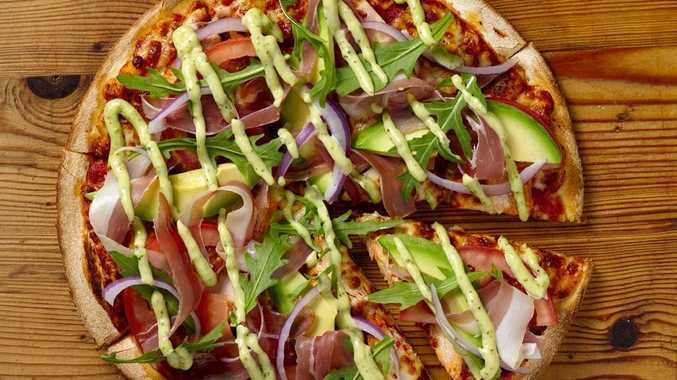 IN a bid to get pizza lovers to try something new, Crust Gourmet Pizza Bars have just introduced nine daring new items to their already delicious menu. Back by popular demand is the satay chicken pizza, joined by eight delicious items all available in store now, including the deliciously naughty rocky road calzone, hokey pokey calzone, cookies and cream dessert, chicken pesto club pizza, all-time favourite flavour peri-peri chicken in a calzone form, vegetarian calzone, prosciutto wraps and herb and garlic ciabatta. Although Crust Head chef Peter Augoustis is not giving up the secret ingredients of those fine foods, he has kindly given Easy Eating readers the chance to make their own mouth-watering Pesto Chicken Club pizza at home. Makes 3-4 balls of dough, about 30cm pizza. PREHEAT fan-forced oven to 275°C. Put water in mix bowl, add yeast and mix until cloudy, add flour, for best results, sift but not necessary. It's a good idea to keep extra 250g of flour to add, in case runny. Place warm, damp tea towel over dough and place in bowl to allow proper rising. After 30 minutes, cut and portion by rolling into balls and cover. Leave overnight to sit. Or for immediate use, place warm damp tea towel over rolled dough balls for 1-3 hours in room temperature. Roll out dough ball using pin, making sure flour is dusted to prevent sticking, place rolled base on the underside of a bake pan then slide onto oiled pan. Spike pizza base with fork. Line pizza base with pizza sauce leaving a 10mm rim from the edge. Sprinkle the rest of the mozzarella evenly over everything. Place cooked marinated chicken breast fillets evenly across pizza. Lay the prosciutto in between. Top with thin sliced tomato and onion. Then lightly sprinkle garlic and the rest of the mozzarella cheese. Cook on fan force 275°C for 10- 15 minutes (or until crust is golden). Garnish with pesto aioli and fresh rocket.